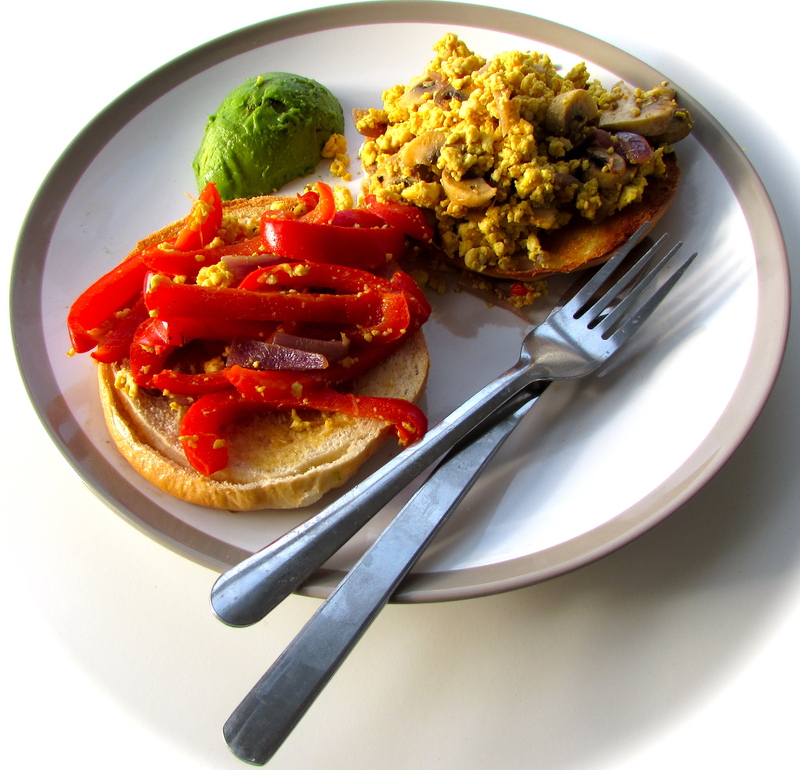 Scrambled tofu, served with sautéed vegetables on an open bagel, makes a filling and flavoursome vegan brunch. It’s packed with protein and nutritious goodness, and injects plenty of colour onto your plate. It’s a great way to kickstart start your day. Tofu, made from soy beans and water, is an ingredient I usually use at dinner time; in stir fries and curries. If you prepare it with patience by ensuring you press as much water out of it as possible, it’s very versatile and quite easy to use. In this dish, the texture of the tofu is similar to scrambled egg, making it perfect for brunch-time eating. Its best quality is its ability to soak up and absorb strong flavours; which is demonstrated in this recipe as the taste of garlic, cumin and chilli tickle your tastebuds. Teamed with the sweet flavouring of the red pepper and the juicy, succulent mushrooms, this is a really tasty dish that will get you well on your way to your five-a-day. 1. Put the tofu on a plate and balance a chopping board on top, or something sturdy and weighty. Leave the tofu for 20-30 minutes, until the majority of the water has been pressed out. 2. Meanwhile, put a large frying pan or wok on a medium heat and pour in the oil. 3. When the oil has heated through, add the onion, pepper and garlic and fry for five minutes, stirring frequently. 4. While the vegetables are cooking, tip the spices into a bowl with a tablespoon of water and stir into a paste. 5. Add the mushrooms to the pan and cook for a further five minutes, making sure the vegetables cook without browning. Push the vegetables to one side of the pan. 6. Pat the tofu dry with some kitchen roll and place on to a clean plate (or rinse the existing plate and re-use). Mash the tofu up with the back of the fork, so it breaks up into rough, bitesize chunks. 7. Add the tofu to the empty side of the pan and cook for two minutes, stirring often. Pour the paste over the tofu and mix it in well so it covers all of the tofu. Cook for another two to three minutes. 8. While the tofu is cooking, toast the bagels and spread generously with olive spread. Place on a large plate. 9. When the tofu is ready, divide it in two and place on one half of the bagel on each plate. Do the same with the sautéed vegetables on the other half of the bagel. 10. Serve with half an avocado on each plate and sprinkle over a little bit of lemon juice. This recipe was inspired by the Minimalist Baker and prepared by my wonderful boyfriend.